For all your Real Estate needs talk to a Telluride native. I have spent a lifetime in Telluride. Every season I am reminded why I love it here. I enjoy outdoor activities that each season brings. The Views of the jagged Mountains, the lush meadows and the abundant wildlife never cease to amaze me. As I ride my bike to work each day, I notice new avalanche chutes and leaves budding or changing colors. I enjoy the summer festivals, community service, the ever-changing faces and especially skiing. Let me share my love for this awesome place with you. Scott Bennett was born and raised in Telluride, where for generations his family has called home. Scott is carrying on the family tradition as Chief of the Telluride Volunteer Fire Department. Scott and his wife Pam have raised their own family in Telluride. They have three wonderful children. Ashley, 29, graduated from the University of Colorado at Denver and operates a dinner sleigh ride business on the Aldasoro Family Ranch. Luke, 26, is a landscape contractor in Grand Junction Colorado. Their youngest son, Chandler, 19, is an outdoor sports nut, and is attending college at Montana State University in Bozeman. 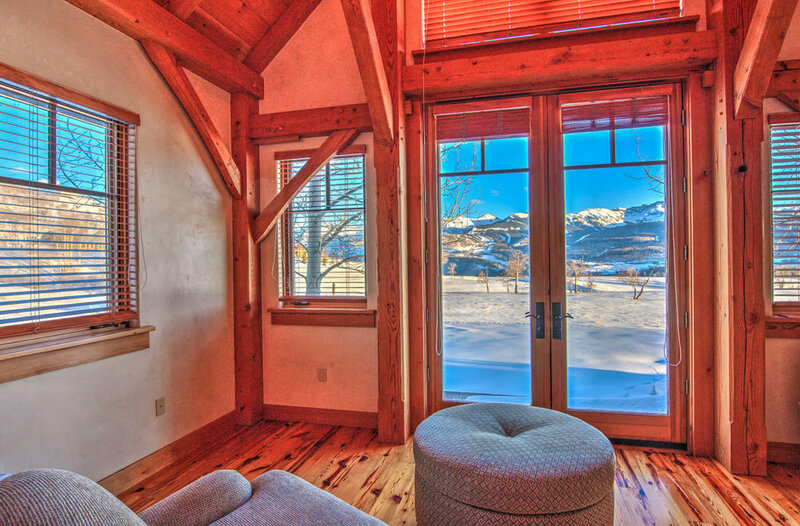 Scott’s expertise in real estate in Telluride, Colorado comes from years of construction, development and sales. He was involved in the development of the Aldasoro Ranch as a CAD technician designing roads, utilities and coordinating the survey work. He was a member of the Aldasoro Design Review Board as chairman for 4 years. Scott was also involved in the development of Diamond Ranch and Golden Ledge, residential communities in the Telluride region. Scott has an intimate knowledge of properties throughout the region and would like to share his passion for Telluride Real Estate with you. 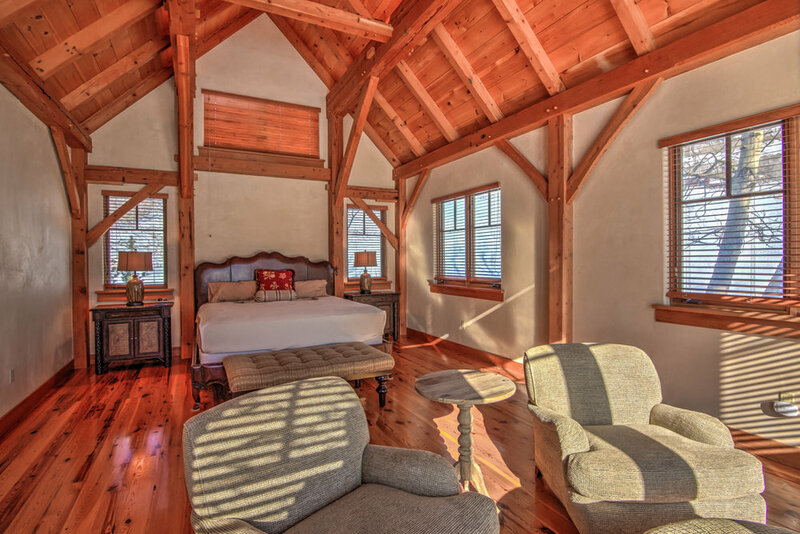 Meticulously built Timber Frame home sited on a 7.05 acre lot to encompass the views of Mt. Wilson, Sunshine Peak, Palmyra Peak and Telluride Ski Area. The 4 bedroom, 5449 square foot residence offers a comfortable layout with large master suite on the main level, 2 guest bedrooms on second level and a spacious bunk room/game room above garage. The wonderful south-facing outdoor living space flows onto a terraced landscape surrounded by 20+ acres of Open Space. It's just minutes from the world class skiing and dining in Telluride and Mountain Village. This is great lot with huge views of Wilson, Sunshine and the surrounding mountains. A must see... Dogs are now allowed! A beautiful custom home Down Valley offering large living room windows that perfectly frame the red cliff views. Features high-end fixtures and finishes, it offers a great 4 bedroom floor plan and large outdoor decks and fenced yards. There is a 1 bedroom, 1 bath apartment/office above the two garage. 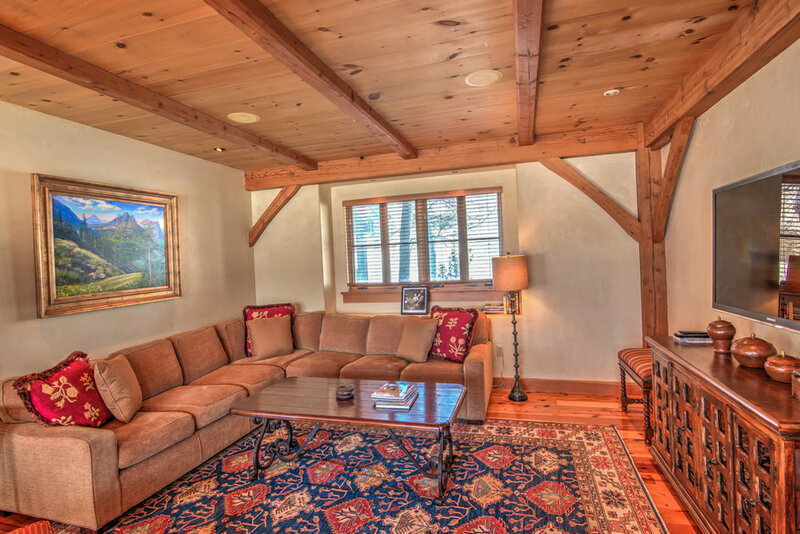 It is truly a must see home for those seeking all that Telluride Region has to offer at a very reasonable price! 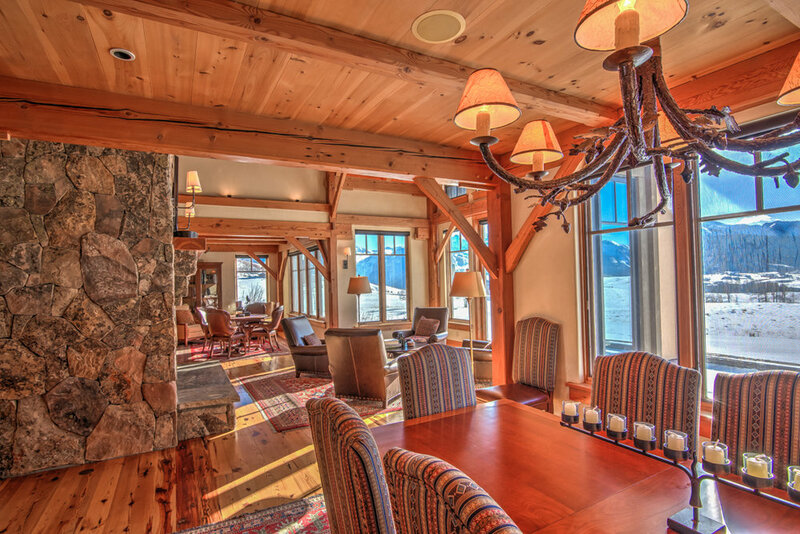 A true Ski in/ski out custom log home just steps from the Double Cabins ski run. This is a great family home with 5 bedrooms including 2 master suites with over 7000 square feet of living space..
Our community has grown from a mining boomtown to a destination ski resort. Since the inception of the Ski Area in 1972 the complexion of Telluride and the whole region has changed dramatically, yet continuing to be a wonderful place to raise a family. The region offers great diversity in its lifestyle choices, find yours. The Town of Telluride is a charming little town with a wonderfully colorful history. Founded in 1880, Telluride is famed for being the first bank robbed by Butch Cassidy, the first alternating current power plant developed by L.L. Nunn and George Westinghouse, and now a world class Ski Town. The town of Telluride is the cultural epicenter offering the best dining, festivals and night life combined with history and recreational opportunities all within walking distance to the ski lift. Town has an inviting mix of residential and accommodations with a historic commercial core that is relaxed and friendly. Based at the western slope of the Telluride Ski Area, the Mountain Village was inspired by European mountain architecture. It encompasses the regions only golf course, offers a mix of ski-in ski-out, and golf course lifestyles. The Mountain Village is linked to Telluride by a free gondola. 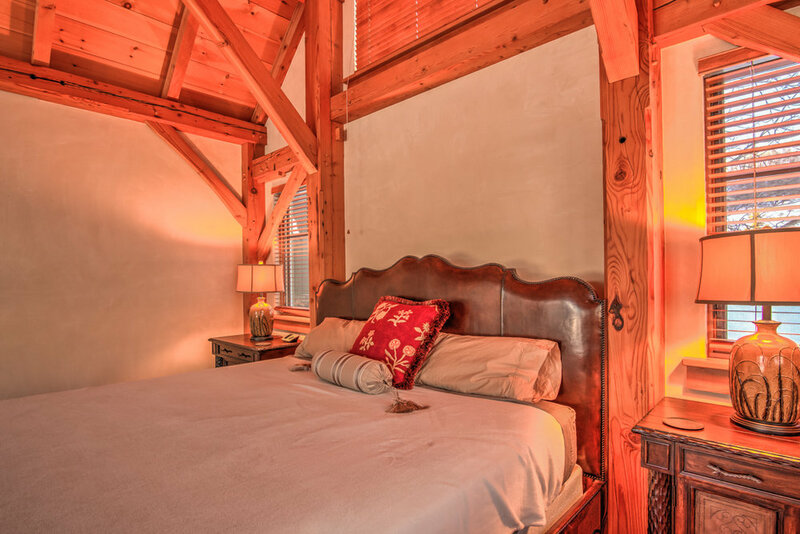 Mountain Village has a variety of real estate opportunities from fractional ownership, condominium units as well as single family residential. There are many lifestyle opportunities in the Telluride region, from back-country access out your back door to ranch living. Call Scott today and have help guide you to the lifestyle of your dreams and become part of Telluride's colorful history.